As of today, I have completed three (almost sequential) rounds of Whole30. If you aren’t familiar with the program, it is a self guided food program (or diet if you will) that focuses on eliminating negative inflammation prone foods in order for you to reset your body. During the 30 days, you are guided to focus on whole foods – this means unprocessed foods with no added sugars or preservatives. The program also has you eliminate other types of foods that are known to cause inflammation in the body or trigger hormonal reactions such as dairy, grains, legumes, and corn. Oh, and alcohol too. The basis of the program is to get you on a clean diet for 30 days allowing you to slay the “sugar dragon” and reset your hormones breaking any unhealthy psychological and physiological relationships with food therefore providing “food freedom”. After the 30 days you are able to slowly re-incorporate foods into your diet, while observing how they impact your body. When I first heard of the Whole30 I was very skeptical. My sister had done it several times and had positive results in regards to weight loss and overall health, but to me, the diet seemed too limiting. I am already a gluten free vegetarian and I rely on food sources such as beans and rice, tofu, and legumes to hit my daily protein needs – so how would I survive if I cut those out? I basically told myself that I would never do Whole30, which pretty much guaranteed me that at some point in my life it would be done – because as soon as I say never, the universe laughs and says “we’ll see about that”. My mother, who has struggled with weight as far back as I can remember, tried out the program about two years ago. The amazing thing is that she started it and just never stopped. She took the knowledge of how to eat and made a lifestyle change that, in my opinion, has given her life and her relationship with food a complete makeover. She looks fantastic and has such a different level of energy and positivity. I have been so proud to watch her through this journey. Her energy is contagious and she truly glows. I have been inspired witnessing her personal transformation. Although it may not seem like it from an outside perspective, I have battled my weight since I was in late elementary school. I became a very chubby kid and did not look like most of my peers. Since then I’ve had a relatively unhealthy relationship with food and my body. 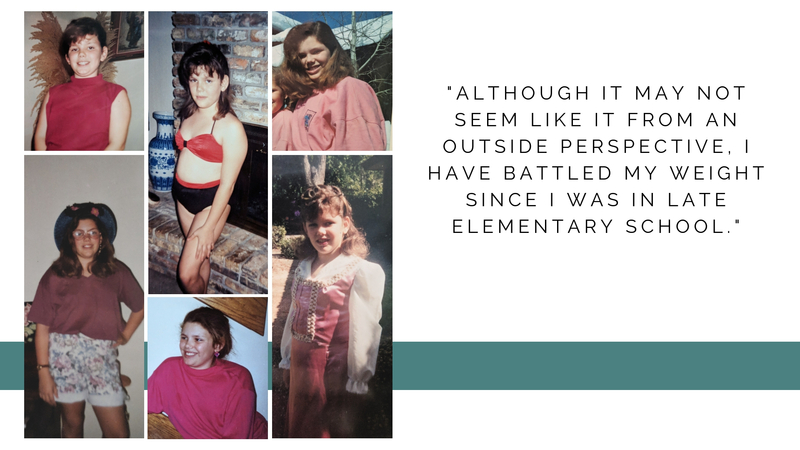 I battled Bulimia in college and early adulthood, tried to lose weight through diet pills and restrictive eating, and have tried numerous fad diets – none of which helped me achieve a body I was proud of nor did it help me gain a positive relationship with food. In fact, it did quite the opposite, which is part of why I didn’t want to go down the Whole30 rabbit hole. I did not trust it. That said, my mom’s success with the program intrigued me. I honestly started researching Whole30 not because I had any intention to follow through with the program, but more so that I was worried about my mom. I was concerned that she was being too restrictive. I needed to understand the reasoning and the science behind it all. So I started reading. I borrowed several Whole30 books from the library – starting with “It Starts with Food”, which was the first book written by the developers of the program Melissa and Dallas Hartwig. I highly recommend reading the book if you are interested in the program. It gave me a better understanding of the why. A lot of the food that was being cut, was going to be introduced back later and is only being cut for the first 30 days to help give each individual a baseline or blank slate in order to figure out what foods work for them and which do not. Another huge focus was breaking the dysfunctional relationship with food. Again, I was skeptical that this could happen. I have always had a bad relationship with food. And I mean always. I remember being in elementary school and licking slices of pizza so that I could guarantee myself a second (or third) slice before my siblings got to it, or finding mom’s hidden stash of sweet treats and going nuts eating all I could. I even remember finding a sour punch rope candy on the ground walking home from the school bus one day and eating it – and if my memory serves me correctly, it was already open! Ugh, that memory makes my heart and stomach hurt. Those particular memories aren’t even inclusive of the later years which involve heartbreaking stories of binging and purging. As I read, I started wondering if it was worth giving the program a try. At the time I was a vegetarian and I knew I would have to do something about the protein aspect of the diet. I decided that instead of making concessions to the program to fit around a vegetarian lifestyle (which they do allow), that I would choose to include fish and eggs in lieu of the tofu and legumes over the 30 days. The more I read, the more I felt up to the time limited challenge of the program. I also deeply believe that psychologically I gave myself permission to succeed since my mom has succeeded. I have always been concerned that I would end up battling my weight my entire life, just like my mother. I had dated someone who was very into fitness that had commented that they didn’t think they could marry me because my mother was a predictor of my future body shape. When I looked in the mirror, I saw her, not me – so there was no winning the battle. I honestly feel shame and guilt for carrying this fear around and extremely vulnerable expressing it on a public forum because it involves my mother and not just myself, but it is a big piece of my journey. As I work through my feelings, I recognize that it has affected me far deeper than I ever perceived. Seeing my mom succeed and reshape her life has, in a way, given me the permission I needed to let go of this fear. Holding onto the belief that I was destined to struggle and never achieve my goals only held me back from achieving them. After some prep work, a major food shopping spree, and an announcement to my family, I decided to start my Whole30 journey the day the kids went back to school. I filled the house with fresh fruits and veggies and created a general food plan for the first week to get me going. Unfortunately, two days into the program I realized that the pickles I was munching on had added sugar! I could have let this be an excuse to stop the program altogether, but instead I just reset and went back to day one. I was not giving up. The first week was exciting, but by week two I was already feeling challenged. We had visitors in town which meant eating out at restaurants and grabbing take out. This also meant having to forego my favorite foods in order to stay compliant with the program. I had to give myself several pep talks and force myself to just get through the moment. I realized that the desire for the foods dissipated very quickly, especially when I ate something that was Whole30 approved that I enjoyed. I just had to make sure that I was prepared and had food on hand that not only fit into the program, but that I liked and looked forward to eating. I found that roasted veggies were my favorite by far. I would switch up the various veggies and seasonings and often throw a leaky egg on top and some fresh homemade guacamole on the side. I started to crave these meals and the other previously enticing foods did not seem as appealing. By week three I was getting bored though. I had not switched things up enough and I was ready for the program to be over. I was not seeing much change to my body and I was feeling grumpy and hungry. I was also PMSing, which caused me to crave sugar. 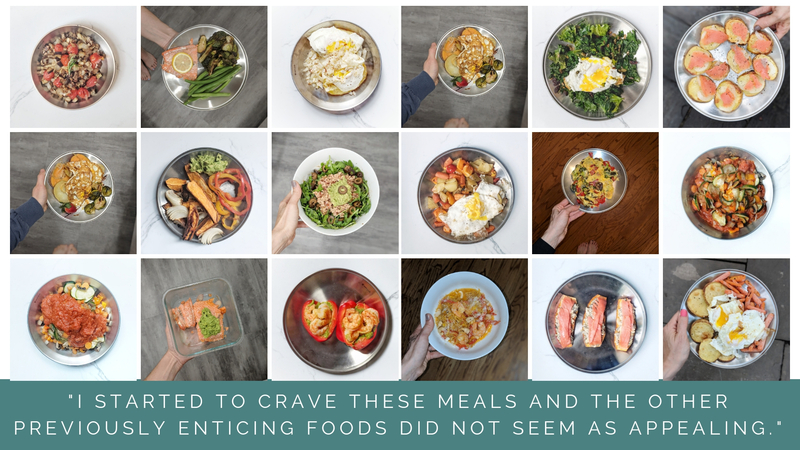 On week three I overindulged on nuts and dried mango – which albeit Whole30 approved food, is not really Whole30 approved behavior, but it is part of the learning process. I forgave myself and moved past it, completing the program the following week. I was proud of myself for following through with the program, but I was not in the right mindset for the slow reintegration of foods, but rather for a feast of Thai food and gluten free pizza. I knew I had lost a bit of weight – 6 pounds that month – but I didn’t see enough of a change to feel like it was life changing and to be honest, I wanted the foods I wanted. Funny enough though, without thinking about it I made myself a Whole30 compliant breakfast before having our Thai lunch, and then again the next day I stayed within the program’s guidelines for both breakfast and lunch before having my pizza for dinner. By the end of my second non-compliant meal I was feeling satisfied, but ready to get back onto Whole30. The feeling actually surprised me as I had never anticipated wanting to do it ever again. Despite my desire to go for round 2, I knew my parents were coming into town and I did not want to be on the program during their visit and my all or nothing personality doesn’t really allow “cheating” on the program. I pulled out the calendar, and wouldn’t you know it – they flew into town late the evening of the 30th day! The universe was encouraging me to keep going – so I did. Round two was much easier. I also recognized that I had neglected various seasoning, such as curry, which opened up a whole world of flavors. I got a little more creative in my cooking – spiralizing squash and zucchini, using cauliflower rice, and incorporating Whole30 approved marinara sauce – while also falling into a routine of my favorite roasted vegetable plates. I still struggled a bit around the time of my period, but never fell outside of the parameters and was able to use better self control in regards to the nuts (salty) and the dried mango (sweet) that I was craving. 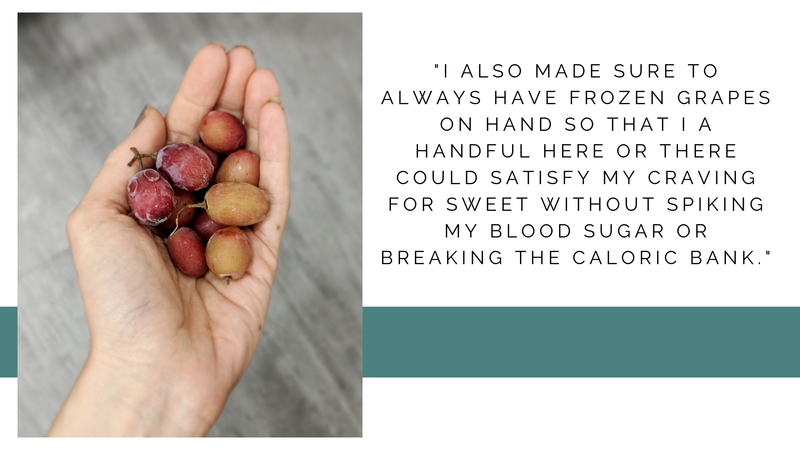 I also made sure to always have frozen grapes on hand so that I a handful here or there could satisfy my craving for sweet without spiking my blood sugar or breaking the caloric bank. The end of round 2 arrived before I knew it and I never had the feeling that I was ready for it to be over. Although I thoroughly enjoyed eating out at my favorite Thai and Indian restaurants while my parents were in town, I continued to crave the structure of the program and contemplated a third round. I knew I had a friend’s wedding coming up at the end of November and there was no way I would want to be on the program at her wedding, so once again I pulled out the calendar to see what the completion date would be if I went for round 3. I couldn’t believe it – day 30 was the day before her wedding! Again the universe had aligned with my plans and encouraged me to succeed. I was all in once again for a third round. This time, it was easy. Clean eating was now becoming a lifestyle. As long as I stayed prepared and one step ahead of the hurdles I was golden. This meant traveling with Whole30 compliant foods and looking up menu options before arriving at restaurants so I knew and was excited about what I was going to order. The month flew by faster than I ever expected and I feel better than ever. I don’t crave sugars. I don’t feel controlled by food. And I never feel guilty for what I eat. Even if I eat larger portions than I feel like I need (like 2 full potatoes instead of one) because I’m hungry, there is no guilt. Zero. I know that I am giving my body what it needs. Now, I could still over do it on nuts if I allowed myself to, or dried fruit, or Lara bars, but I keep in mind that those are to be used sparingly and that the focus of the program is indeed food freedom. So when I am craving one of the aforementioned items, I count to 5, drink some water, distract myself, and if that doesn’t work, then I just eat it, because that’s what I want and I am not about deprivation. The program has worked tremendously for me and I am happier than ever when it comes to food. Overall, I dropped about 10 pounds and now fit back into all my pants. 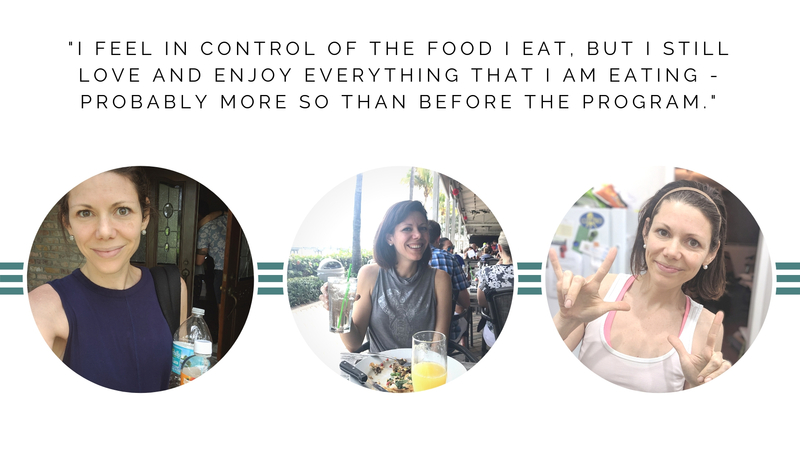 I feel in control of the food I eat, but I still love and enjoy everything that I am eating – probably more so than before the program. Foods taste more alive – the fruit is sweeter and the vegetables more satisfying. I also feel like I am a good role model for those around me, including my children. I am intentional and grateful for the food I eat. My confidence is higher and I feel no guilt or shame. I highly recommend the program for anyone looking for food freedom, but know that if I would have quit after the first 30 days, that it would not have been as transformational for me. 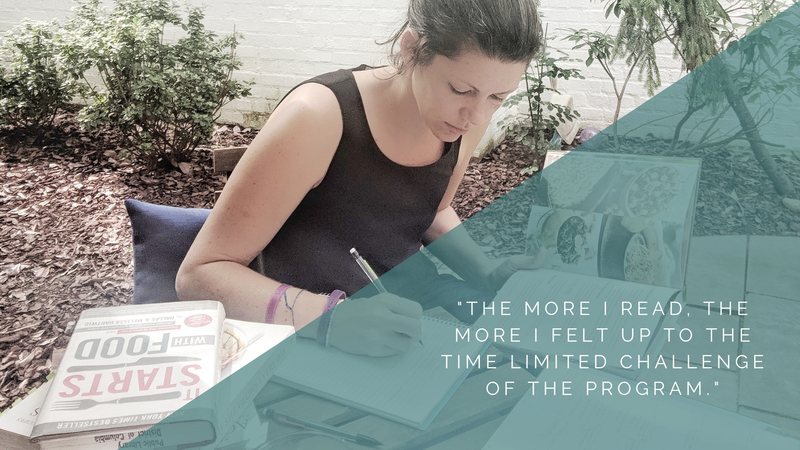 Continuing on for an additional two rounds was important for the lifestyle shift to click – but I also believe giving myself the weekend off in between rounds was important. Additionally, I got lucky that the universe aligned with upcoming event dates, but the reality is that if I had wanted to use it as an excuse not to do the program I would have. I was ready for change and I embraced it – and I am so thankful that I did. For me, it is not about the weight lost – although that is the organic coconut cream, date sweetened icing on top – it is about the true change in my relationship with food. That is the game changer. So now, the next phase of my personal transformation is incorporating the right level of fitness. I have found a program that seems to be working for me and I’m excited to see how it transpires, but more on that later! 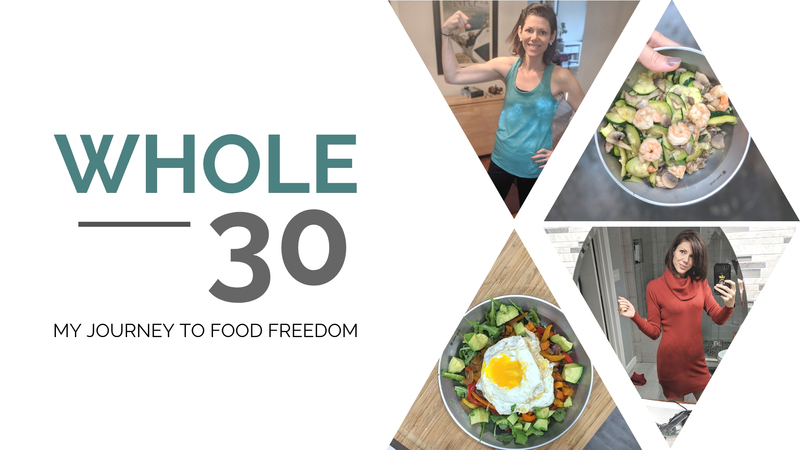 If you have any questions or comments about the Whole30, or my personal journey – feel free to comment or reach out. 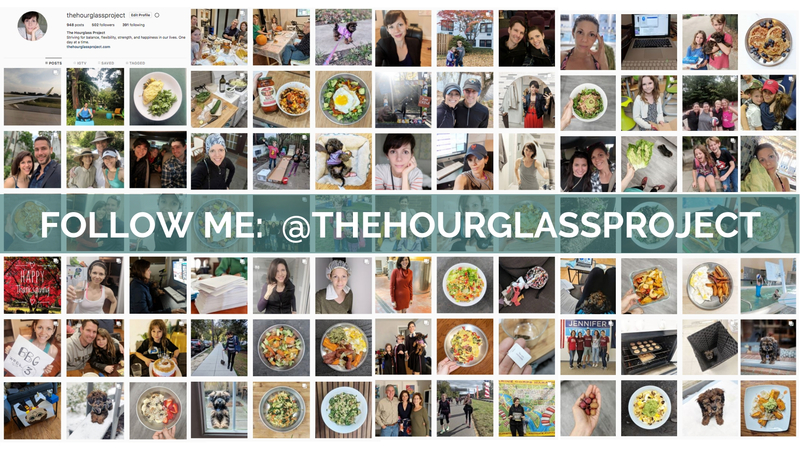 Want to learn more about what I eat or keep up with my journey, follow me on instagram (@thehourglassproject) for daily updates.